BRICSCoin could be the world’s newest currency. 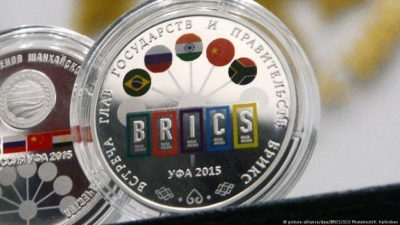 The Head of the Russian Direct Investment Fund (RDIF) Kirill Dmitriev has stated that the BRICS may opt to create their own cryptocurrency for the purposes of global commerce. A cryptocurrency is a digitally based means of exchange wherein the value of said currency is not determined by a central-bank. Most cryptocurrencies can be converted into state-issued currencies (Dollars, Euros, Yuan, etc.) through various foreign exchange services. Currently, one of the biggest issues facing crypocurrency development is the fact that they are not backed up by any central bank. However, many also see this apparent disadvantage as a possible opportunity, particularly where unilateral Dollar based sanctions are concerned. While the US Dollar remains the most popular global trading and reserve currency, this is rapidly changing. A BRICS backed cryptocurrency may be both the proverbial ‘Dollar buster’ as well as a ‘sanctions buster’. In May of this year, China and Russia agreed to begin a process of trade in local currencies. Turkey and Iran have also begun steps to break away from the Dollar. Even more recently, China announced that is plans to allow for oil trading in Yuan which will be convertible to gold at the Shanghai and Hong Kong international gold exchanges. The creation of a BRICS cryptocurrency could potentially retain the flexibility of current cryptocurrencies with the additional benefit of being backed by the leaders of a large economic-trading union which would give traders confidence in such a currency that many existing cryptos such as Bitcoin are lacking. It is not certain what the exchange rate of a would-be BRICSCoin would be, but there is every chance that it could be based on a derivative of what is known as Special drawing rights (XDR) a current means of exchange which pools the values of the US Dollar, British Pound, Japanese Yen and the Euro. A possible variation which would set the initial exchange rates of a BRICSCoin could be a combination of a gold backed Chinese Yuan, Russian Rouble, Indian Rupee, South African Rand and Brazilian Real. This could create an effective hybrid currency that could easy trade and make exchange rates between BRICS states and their partnership more equitable. There is also a potential for such a currency to be used as a means of everyday exchange among businesses and individuals in growing and emerging markets that seek to partner with the BRICS in the so-called BRICS Plus format. While cryptocurrencies are relatively easy to create, they are more difficult to promote as a widely accepted means of exchange. However, with the prominent economies of the BRICS backing such a currency, this problem could be easily bypassed, as a semi-central regulatory body would likely be the logical outgrowth of such an initiative. “Another topic discussed by the financial committee was cryptocurrencies. The creation of BRICS’ cryptocurrency as an alternative to other payment tools might also be discussed. …cryptocurencies are also being discussed as one of the possible options for financial settlement. For particular payments it might be quite relevant and serve as a good alternative to the dollar or any other currency. We estimate that the mutual investments of the BRICS countries might see an increase by 3-4 times due to such instruments as BRICS [Development] Bank”. In many ways, the most powerful asset the US has internationally is the Dollar. If the effective hegemony of the Dollar is broken, it could be a substantial opportunity for emerging markets to assert their monetary and consequentially fiscal independence. Russia is already taking its own steps towards developing its own cryptocurrency. According to Communications Minister Nikolay Nikiforov, a Russian cryptocurrency will be designed to work with existing Russian technologies rather than the foreign technologies which form the basis of the Bitcorn blockchain. “Bitcoin and Etherium are cryptocurrencies developed on the basis of foreign cryptography. Russia has its own cryptography school. I think that we are absolutely capable of creating a cryptographic unit, a tool, based on the blockchain technology, and work out concrete regulations to set the framework for the operations”. Such a currency could receive an official sanction from the Russian Central Bank. This technology could be used to help develop the BRICS wide crypto which has been widely discussed at the current summit. The BRICS summit in Xiamen continues through the 5th of September. Featured image is from BRICS/SCO Photohost.